The first two sessions on Sunday were Collaboration and why it is so hard and the following, which was a perfect following session was on Kanban. While in that second session two online Saas Style Tools were mentioned; AgileZen and Leankit. I decided right then and there that I would throw together some first impressions and setup some sample projects. I did this by setting up an account and creating the projects. Setting up the initial account required an e-mail verification, which is understandable. Within a few seconds it was mailed out and I was logged in. The initial setup of the board was pretty easy. I maybe clicked around an extra few times, but overall everything I needed to use the tool was immediately available. The representation of everything was very similar to what one expects in a real Kanban Board too. This is a HUGE plus, especially if a team is smart and places this tool in a centrally viewable area to allow for visibility. Each of the board items is just like a post it, being blue, grey, green, pink, or one of another few colors. Dragging them onto each swim lane on the board was flawless, making changes through the work super easy and intuitive. The other thing I really liked about AgileZen is that the Kanban Board had the swim lanes setup immediately. One can change them, but when you know you immediately need a Ready Lane, Working Lane, and a Complete Lane it is nice to just have them right in front of you in the interface. In addition, the Backlog is simply a little tab on the left hand side. This is perfect for the Backlog Queue. Out of the way, with the focus on the primary items. Once I got the items onto the board I was easily able to get back to the actual work at hand versus playing around with the tool. The fact that it was so easy to use, fast and easy UX, and overall a great layout put me back to work on things I needed to do versus sitting a playing with the tool. That, in the end is the key to using these tools. Setting up the account got me straight into the online tool. This I thought was pretty cool. Setting up the Kanban Board within Leankit was a bit of trouble. There were multiple UX issues in regard to process and intuitiveness. The Leankit basically forces one to design the whole board first, making no assumptions about how the board should look. The swim lanes in my humble opinion should be setup immediately without any manipulation with the most common lanes; ready, working, and complete. The other UX hiccup that I had a problem with is that as soon as I managed to get the swim lanes into place, I wanted to remove the redundant Backlog Lane. The Backlog Lane, or Backlog Bucket should be somewhere that I accidentally added as a lane. 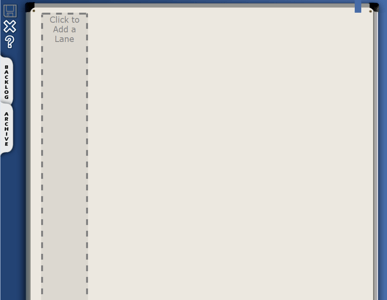 Then on top of that I screwed up and added an item inside the lane, which then prevented me from deleting the lane. I had to go back out of the lane manipulation, remove the item, and then remove the excess lane. 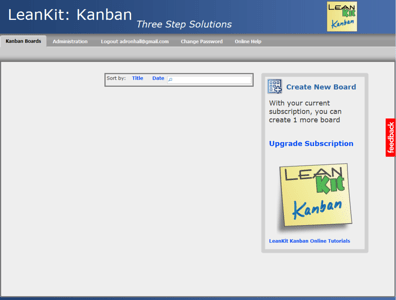 Leankit wasn’t a bad interface, it just wasn’t as good as AgileZen. The AgileZen interface was just better UX design overall. 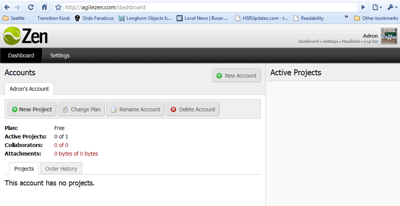 AgileZen also presents a much better user interface graphical design all together. It is much closer to what the Kanban Board would look like if it were a physical Kanban Board. Since one of the HUGE reasons for Kanban is to increase visibility, the fact the design is similar to what a real Kanban Board is actually a pretty big deal. 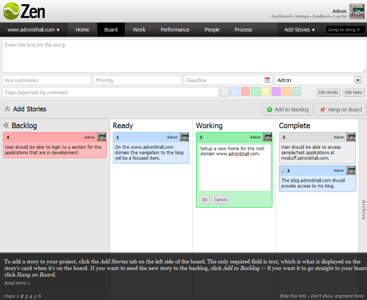 This is an image (click for larger) that shows the two Kanban Boards side by side. The one on the left is AgileZen and the right is Leankit. 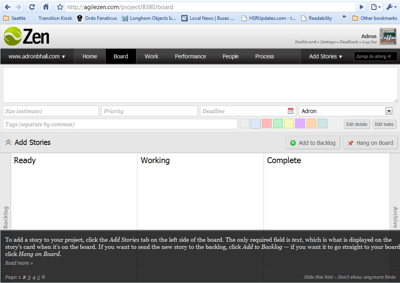 This entry was posted in Reviews and tagged agile, kanban on April 11, 2010 by Adron.